Attractive antique Victorian oak open bookcase. A lovely antique Victorian oak bookcase. We date this bookcase to the second half of the 19th century. The bookcase sits on a plain plinth base and is supplied as a single section. The interior of the bookcase is fitted with three adjustable position, removable wood shelves. The shelves have their original leather decorative trim to the undersides. The bookcase has an overall height of 42.5" (108cm), a width of 44.5" (113cm) and a depth of 11.5" (29cm). The shelves have a depth of 9.5" (24cm). This lovely antique Victorian oak bookcase remains in very good solid condition with only very minor surface markings commensurate with age and usage. There are some minor indentations from past use to the top surface and the shelf supports have been replaced with dowels at some point in the past. 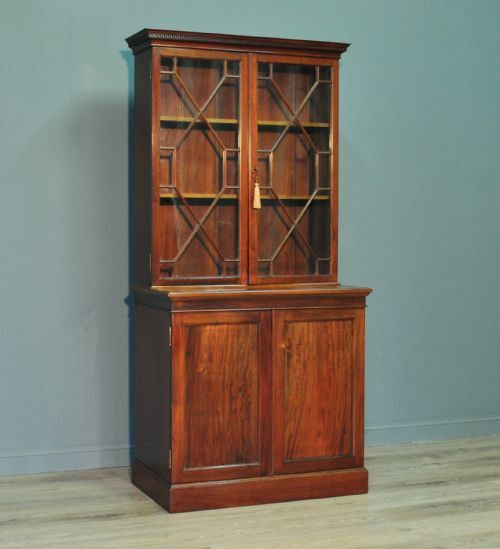 This remains a very stylish and elegant antique Victorian oak bookcase cabinet. It could house a good sized collection of books etc. And will continue to provide sterling service for many years to come. Attractive small antique mahogany bookcase cabinet. A lovely mahogany bookcase cabinet. We date this bookcase to the early 20th century. The main cabinet consists of a glazed section over a lower cupboard. The top section has two adjustable position shelves and has two astral glazed doors. The top section has an integral cornice with a band of greek key style moulding. The doors are fitted with locks (keys supplied). The lower cupboard is fitted with a mid mounted removable shelf. The bookcase has an overall height of 66" (168cm), a main table height of 30" (76cm), a width of 32.5" (83cm) and a base depth of 18.5" (47cm). 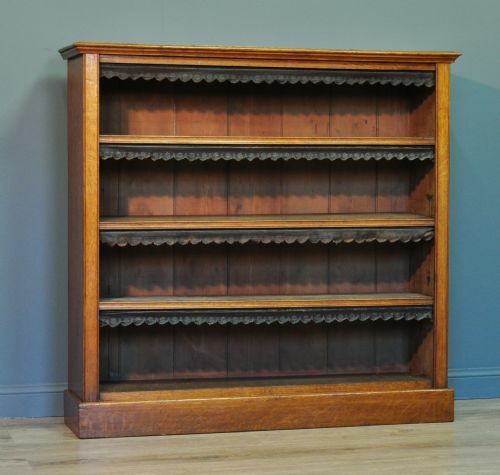 This lovely mahogany bookcase remains in very good solid condition with only minor surface markings commensurate with age and usage, including some minor marks and indentations to the surface finish. There is some slight mellowing and light scratches to the top surface of the base section. 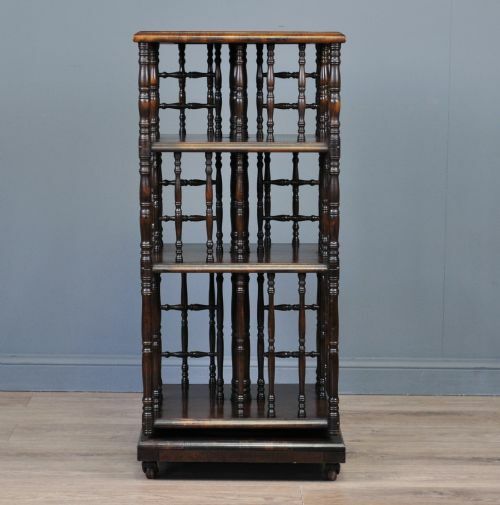 This remains a very stylish and elegant mahogany bookcase. It will continue to provide good service for many years to come. Attractive antique turned mahogany revolving bookcase. A lovely antique mahogany revolving bookcase. We date this bookcase to the very early 20th century. The bookcase sits on a square plinth base. It is attached to a mechanism which allows the top section to revolve. The base sits on its original ceramic castors. The bookcase comprises of three levels, each with four separate sections. This interesting design provides an optimised use of storage space, whilst also remaining very pleasing to the eye. There are vertical turned spars running up each side. The bookcase has a height of 36.5" (93cm) with a width/depth of 17" (43cm). Each section is 6.5" (16cm) wide by 7" (18cm) deep and provides 8", 9" & 12" of usable space from top to bottom. This lovely revolving bookcase remains in very good solid condition with only very minor surface markings commensurate with age and usage. The top surface has a few marks from past use and the finish has caught the sun slightly causing a crazed effect. This remains a very stylish and elegant revolving bookcase which could house a good sized collection of books. It will continue to provide good service for many years to come. 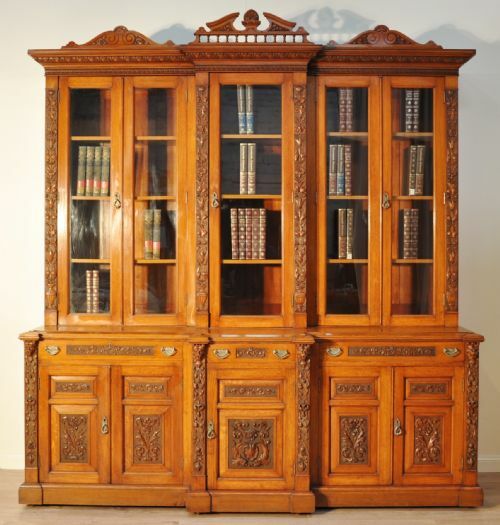 Exceptionally large set of antique pine library bookcase cabinets. An extremely large set of antique pine bookcase cabinets. They have the provenance of coming from a local Sheriff Court, and we date them to the 1900's. The bookcases come in five main large sections with their skirting boards, mouldings and cornices. Due to it's bespoke design, this bookcase would need to be installed by a suitable carpenter. We have additional panels of antique pine which could be supplied at no extra cost, with which to tailor the bookcase ends to your exact requirements. The bookcases are lettered A, B, C, D, E, F, G, H, J & K. They have three differing depths and three sections create an attractive break front design. The bookcase doors have brass lattice work with linen fold green curtains to the rear. They would have likely been glazed originally, and have had this lattice work to replace the glass in order to protect the books from sunlight. The doors are fitted with working locks (keys supplied). Doors A - D are of a standard side hinged design and doors E - H are of a double-hinged design, whereby the two inner doors are hinged to the two outer doors. The interiors are fitted with height adjustable shelves which sit on small metal pegs housed in a series of holes in the sides of the cabinet. Each bookcase has an overall height of 102" (259cm). Bookcase A - B has a width of 107.5" (273cm) and a depth of 14.5" (37cm). The shelves are 53" (135cm) wide by 12" (31cm) deep. Bookcase C - D has a width of 103.5" (263cm) and a depth of 14.5" (37cm). The shelves are 49" (125cm) wide by 12" (31cm) deep. Bookcase E - F has a width of 100" (254cm) and a depth of 17" (cm). The shelves are 48" (122cm) wide by 13.5" (35cm) deep. Bookcase G - H has a width of 100" (254cm) and a depth of 21" (cm). The shelves are 48" (122cm) wide by 17.5" (45cm) deep. Bookcase J - K has a width of 100" (254cm) and a depth of 17" (cm). The shelves are 48" (122cm) wide by 13.5" (35cm) deep. The cornice adds an additional 4" (10cm) of depth to each section. This lovely antique pine court/library bookcase has been constructed to a very high standard and it remains in very good solid condition. There are some minor spots of wear and usage marks, and some marks where they were taken out of the court house. This set of library bookcases remains as impressive and majestic as when it was originally built. It will surely prove to be an exceptional talking point and provide an excellent amount of storage space for years to come. ATTRACTIVE VERY LARGE ANTIQUE VICTORIAN CARVED OAK GLAZED BREAKFRONT BOOKCASE CABINET. A LOVELY VICTORIAN OAK BOOKCASE CABINET. WE DATE THIS BOOKCASE TO THE LATE 19th CENTURY. THIS IS AN ATTRACTIVE, HIGH QUALITY BOOKCASE. THE INTERNAL PANELS HAVE BEEN MADE FROM SOLID MAHOGANY, THIS INCLUDES THE DRAWER LININGS AND SHELVES ALSO. THE BOOKCASE COMES IN FIVE SECTIONS: THE LARGE BASE SECTION, THREE GLAZED BOOKCASE SECTIONS AND A SEPARATE CORNICE. THE BASE SITS ON A SLIGHTLY PROTRUDING PLAIN PLINTH BASE AND IS RAISED UP ON RECESSED CASTORS, ALTHOUGH THESE APPEAR TO BE ORIGINAL, THEY CAN BE REMOVED IF REQUIRED. THE CORNICE IS OF STEPPED DESIGN WITH TWO ROWS OF DETAILED CARVING RUNNING ITS LENGTH. THE CORNICE HAS THREE REMOVABLE CRESTING RAILS THAT SIT ON DOWELS AND ARE ALSO DECORATIVELY CARVED. THE FRONT OF THE UPPER BOOKCASE HAS FIVE SIDE HINGED GLAZED DOORS. THE DOORS ARE FITTED WITH DECORATIVE CAST DROP LOOP HANDLES MOUNTED ON SHAPELY EMBOSSED BACK PLATES. THESE DOORS ARE FITTED WITH WORKING LOCKS (KEY SUPPLIED). THE INTERIOR OF EACH BOOKCASE SECTION IS FITTED WITH THREE HEIGHT ADJUSTABLE FULL WIDTH WOODEN SHELVES. THE SHELVES SIT ON WOODEN RAILS HOUSED IN A SERIES OF SLOTS IN THE SIDE PANELS. THE BASE CABINET COMPRISES OF THREE DRAWERS OVER SIDE HINGED DOOR CUPBOARDS. THE DRAWERS ARE FITTED WITH DECORATIVE CAST DROP LOOP HANDLES MOUNTED ON SHAPELY EMBOSSED BACKPLATES. THEY ARE FITTED WITH WORKING LOCKS (KEY SUPPLIED). THERE IS A RECESSED CARVED PANEL BETWEEN THE HANDLES ON ALL THE DRAWERS. THE CUPBOARD DOORS HAVE CARVED RECESSED PANELS. THE DOORS ARE FITTED WITH DECORATIVE CAST DROP LOOP HANDLES MOUNTED ON SHAPELY EMBOSSED BACK PLATES. THESE DOORS ARE FITTED WITH WORKING LOCKS (KEY SUPPLIED). THE CENTRAL DOOR HAS A PAIR OF CARVED SEA SERPENTS TO THE LOWER PANEL. THE PANELS UP THE EDGES OF THE BOOKCASE AND CORNERS OF THE BREAKFRONT ARE ALSO ATTRACTIVELY CARVED, THERE ARE LION MASKS TO THE TOPS OF THE BASE SECTION. THE BOTTOM CUPBOARDS ARE FITTED WITH SINGLE FULL WIDTH WOOD SHELVES. THE SHELVES SIT ON WOOD RAILS AT EITHER SIDE. THE BOOKCASE HAS A HEIGHT OF 107" WITH A BASE HEIGHT OF 37.5", A WIDTH OF 98" AND A BASE DEPTH OF 28". THE OUTER INTERIOR SHELVES ARE 32" WIDE BY 11" DEEP AND CAN BE ADJUSTED IN 1" INCREMENTS. THE CENTRAL SHELVES ARE 22" WIDE BY 14" DEEP. THE OUTER DRAWERS ARE 4" HIGH BY 30" WIDE. THE CENTRAL DRAWER IS 18" WIDE. THE OUTER CUPBOARDS ARE 24.5" HIGH BY 34" WIDE BY 21" DEEP. THE SHELF SITS 12" INSIDE. THE CENTRAL CUPBOARD IS 24.5" HIGH BY 22" WIDE BY 24" DEEP, THE SHELF IS ALSO 12" HIGH. THIS LOVELY VICTORIAN OAK BOOKCASE CABINET HAS BEEN CONSTRUCTED TO A VERY HIGH STANDARD AND REMAINS IN VERY GOOD SOLID CONDITION WITH ONLY VERY MINOR SURFACE MARKINGS COMMENSURATE WITH AGE AND USAGE. THERE ARE A FEW SMALL INDENTS AND MINOR AREAS OF WEAR TO SOME EDGES AND THE CORNICE HAS A FEW TINY SLIVERS MISSING FROM SOME EDGES. THIS REMAINS A VERY STYLISH AND ELEGANT VICTORIAN GLAZED BOOKCASE CABINET WHICH WILL CONTINUE TO PROVIDE STERLING SERVICE FOR MANY YEARS TO COME.